Getting closer! Let’s keep it up! Thanks to the Portage community and the generosity of St. John’s Baptist Episcopal Church, the Portage Family Skate Park project (PFSP) is even closer to achieving their goal. Roughly $600 closer in fact! Bowl by bowl and with dessert options galore, the community came together not only for a delicious meal but for a good cause. With over $50,000 raised to date, enthusiasm continues to build for the upcoming project. It is no surprise that the February 18 Soup Fundraiser was such a success. Aside from the delicious homemade soups, tantalizing smells and lively atmosphere, the spirit of the event stood out the most. Throughout the day guests came and gone. Despite the hustle and bustle, there were times between “rush hour” to reflect and be grateful. Take outs were available as well and “taken” advantage of by many. In addition to the committee board and volunteers, certain individuals and businesses in particular provided notable assistance. 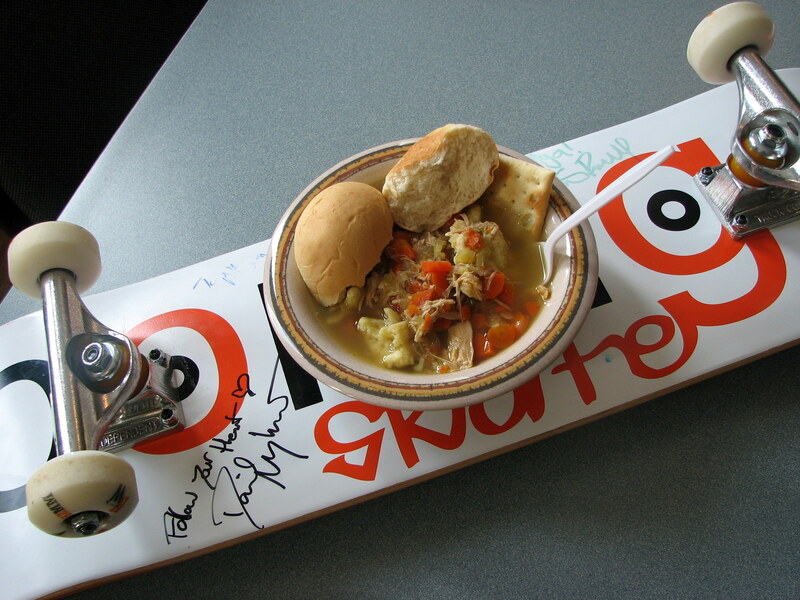 Brandon Hanson, local skateboarder, graciously donated a one-of-a-kind personally signed deck for a raffle prize. (Multiple ones, in fact, for Christmas!) After almost tragically losing Brandon on October 11, 2008, the value of the raffle prize is immeasurable. With the tickets sold, one lucky child was able to select the winner at the end of the evening, choosing one name from a basket of prospects. Nik Ibrami, co-owner and operator of one of Portage’s newest quality restaurants, The Red Apple, donated not only time, but an abundance of homemade soups and fresh rolls. Taking time off from his busy schedule, Nik also helped serve and assist with the PFSP supporters and guests. Alongside him, and also providing soup donations, La Tolteca manager, Alonso, contributed resources and time. “We have to do that,” Nik insisted. “We have to help. I have my own kids. We need to support them, all of the kids. It’s not about giving them what they want it’s about giving them what they need- what will help them. Right now, they need places of to have fun that encourage sports. I’d rather they were outside.” With the attitude and compassion behind Nik and his budding business, it is no surprise that the restaurant has a regular customer base. Joshua wasn’t the only one who traveled so far to show their support. With some driving from over an hour away for a bowl of soup, the evidence speaks for itself that this skatepark is desired. Because of the outpouring of donations, leftovers still remained despite the amount of sales. As a way of giving back, Portage organizations were cheerfully surprised when goodie-baskets arrived. Due to the hospitality of St. John’s Baptist Episcopal Church, the PFSP did what they could to show their gratitude with the remaining donations. These donations would not have been possible without the generosity of Red Apple Restaurant, La Tolteca, Northwoods, Big Dogs, Culvers and Molto Bene Cupcakes. For those who wished to remain anonymous for their donations, we still “anonymously” say thank you! Even if you missed the soup, (and the cupcakes…) you can still get that “comfort food” feeling by donating time, energy or supplies.. What? Time?! Who has time to donate? Well, actually… a text message, wall post or Tweet takes, what, ten seconds? Would you be willing to donate to your community that? Ok here’s where it gets good… Drum roll please….(!) An exciting competition known as “Be the Change,” sponsored by the charitable Sheckler Foundation, will soon be reviewing an entry from the PFSP. If selected as a finalist, a social media competition will decide which community is given the gift of “change.” Coming soon!!! Your ten seconds could make all the difference. For little effort, you too can be a part of the change and help our downtown thrive once again. Please check out the PFSP on your cell, tablet or computer at portageskatepark.org. Support bracelets are currently available at Portage’s downtown business, Prairie Flower Beads, for a mere $2. Other events are listed online for your convenience. Want to stay updated even easier? Follow the PFSP on Twitter @Portagesk8park or on Facebook.com/Portageskatepark. Questions? Contact the PFSP online at portageskatepark.org.